This month’s Daring Cooks’ challenge was right up my alley. We love Japanese food! The February 2011 Daring Cooks’ challenge was hosted by Lisa of Blueberry Girl. She challenged Daring Cooks to make Hiyashi Soba and Tempura. She has various sources for her challenge including japanesefood.about.com, pinkbites.com, and itsybitsyfoodies.com. For the official recipes provided, visit the Daring Cooks. Like any challenge, I like to put my spin on things too. In addition to the soba noodles and tempura, I decided to make some sushi to complete the meal. After a trip to the grocery store for ingredients, I spent a good 3 hours in the kitchen putting together a spectacular Saturday night dinner. Thanks for the great wine Central Bottle! 11. Enjoy the meal and another glass of wine! And now here’s a look at what I made! No recipes in this post, visit the Daring Cook’s link for the recipes for the challenge. But be sure to read through the end for a look at some vintage Good Cook Doris photos and a great story about the last time I made sushi at home. The hubby loves noodles, not just macaroni and cheese. I usually don’t order noodle dishes when we go out because they are one-pot dishes. I love side dishes too much. So I let him choose the soba noodles. There were 5 different types of soba noodles at the store! He selected wheat and buckwheat noodles. Nothing too much to report on cooking here, I followed the directions on the bag and watched carefully to prevent overcooking. I made a simple dipping sauce combining vegetable stock, soy sauce and mirin. For extra flavor and saltiness I added a dash of fish sauce to top the noodles, I honored the challenge and kept it simple. We added julienned cucumbers, carrots, chopped scallions, and bean sprouts. The dish was simple, fresh, and delicious! This was surprisingly simple to prepare. I chose a small assortment of my favorite vegetables to fry: sweet potatoes, green beans, and shitake mushrooms. For fun, I added a few carrots to the mix. I used raw vegetables, with the exception of the sweet potatoes. I blanched them until just tender. Timing was everything for the tempura. I got everything ready and fried the vegetables just before we sat down to eat dinner. As with any fried dish, it is important to set up the assembly line and rack for the fried vegetables to rest. To ensure the batter stayed light and airy, I placed an ice pack in a large bowl and then a smaller bowl on top to mix the batter (we don’t have an ice maker, I had to improvise). I used my trusty kids’ chopsticks to mix up the batter until just combined. I also don't have a skimmer, so I use my stainless steel potato masher to scoop fried foods out of the pot. The dredged and battered vegetables took a 1-2 minute dip in 320 degree vegetable oil and emerged golden brown and perfectly crispy. 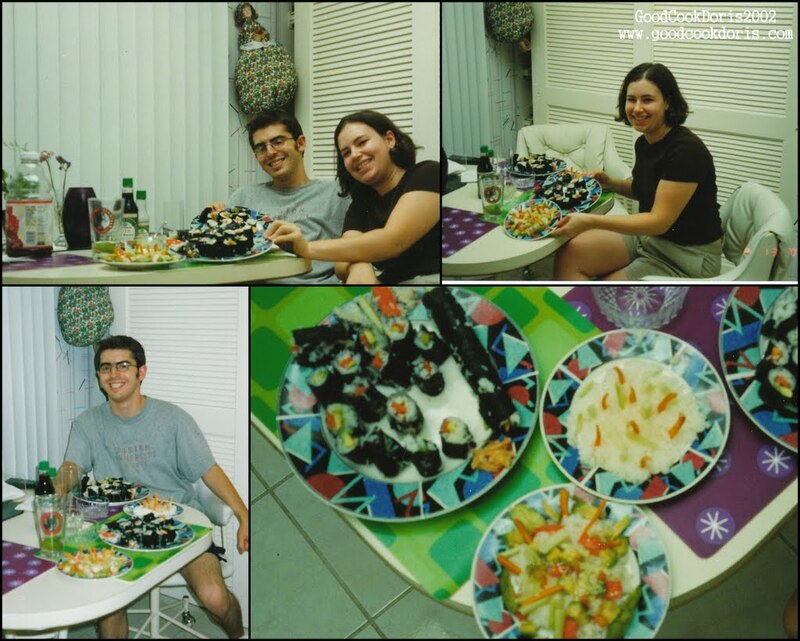 The last time we made sushi was in September 2002. We had graduated from college in May and I had moved to Florida. The hubby was still in Boston and we were doing the long distance thing. One of our favorite things to do when he visited was go out for sushi. There was one place, Yoko, in West Palm Beach that we visited on Saturday nights of our weekends together. The owner, Yoko would sing karaoke along with the music videos on a huge big screen TV. If you’ve seen the pictures of the hubby and me, you’ll notice we are not large people. But we have an uncanny ability to consume obscene amounts of sushi. One particular night at Yoko we placed our order for the Crazy Cat Roll (our favorite) and assortment of other rolls and nigiri, and excitedly awaited the free spicy noodle salad they served before the meal. We watched the waitress walk over to the sushi chef and present him with our order. He read the order and then said something to her. She pointed at us and he looked over with a look of disbelief on his face. He looked down at the order, back at us, and then back at the waitress. Then the waitress came back and told us that the chef wanted to confirm that we really wanted to order so much sushi. We assured her that yes, we did intend to order that amount. She walked back to the chef and relayed the message. He looked at us, shrugged his shoulders and then started rolling. I’m pretty sure he gave us even more rice than usual, but we couldn’t back down and ended up cleaning our plates and leaving completely stuffed. So when we decided on another visit to make sushi at home, of course we made too much! I was living in my grandparent’s condo when I first moved there and we used her pots and pans. I remember the rice being really hard to make and extraordinarily sticky. When I asked the hubby if he remembered making the sushi, he said “Man that sucked, you can quote me on that. My hands hurt so badly after rolling all of that.” With that in mind, I present you with the pictures from September 13, 2002. You can see we gave up rolling. There is an uncut roll of sushi and two plates of rice with julienne vegetables artfully placed on top. You will also notice one of my grandmother’s favorite flea market finds hanging on the wall – the bag lady! This lovely lady has a porcelain face and an empty skirt into which you can stick grocery bags. I’ve had the sushi rolling set in the cabinets for the past 8 years, but haven’t used them until this weekend. I was feeling confident and decided to make spicy salmon inside-out maki. I pulled out the “Easy Sushi” book from the back of the bookshelf and reminded myself how to roll properly. This time the rice came out perfectly (thanks to a little confidence and a foolproof recipe from Alton Brown). I mixed smoked salmon, mayonnaise and sriracha for my spicy salmon mixture. With the rolling station set up, I got to work. By pure luck, the package of nori I picked up was pre-toasted and ready to roll right out of the package. 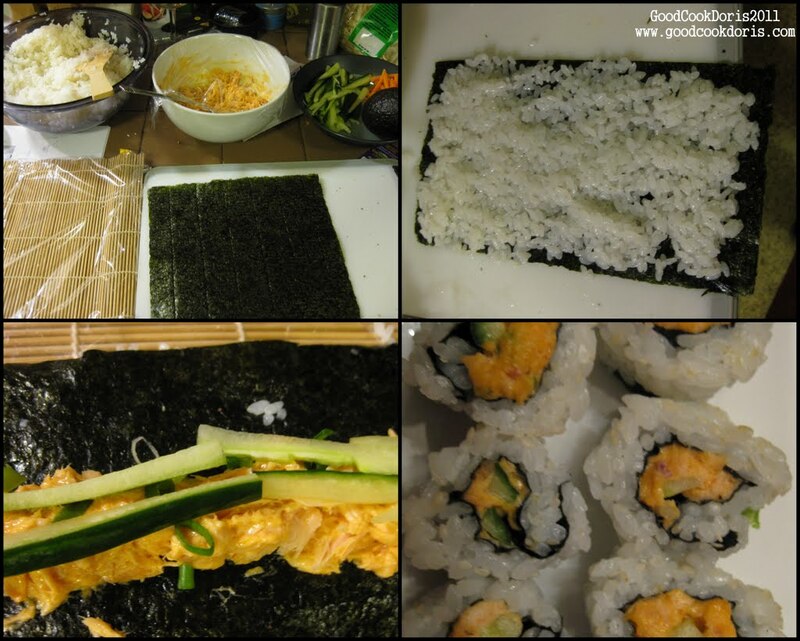 Two sheets, cut in half, made just the right amount of sushi for dinner and leftovers. With all of the dishes prepared and plated, it was time to eat! The meal was simple, clean, and flavorful. It was almost like eating out at a Japanese restaurant! The hubby’s cousin Becky got us a beautiful set of Japanese dishes for our wedding and this was the perfect opportunity to use it. Thanks Daring Cooks for such a fun challenge! And thanks to the hubby for his help! Photographer, moral support, and chief dishwasher. An added bonus? Lunch the next day! WOWOWOW you had a wonderful time doing this challenge and your photo of the final dishes is stunning wonderful work and the sushi is brilliant. Bravo. Love everything about your post, from your detailed step-by-step to your cool chopsticks! So glad you had such a wonderful time doing this challenge! YUM!!! 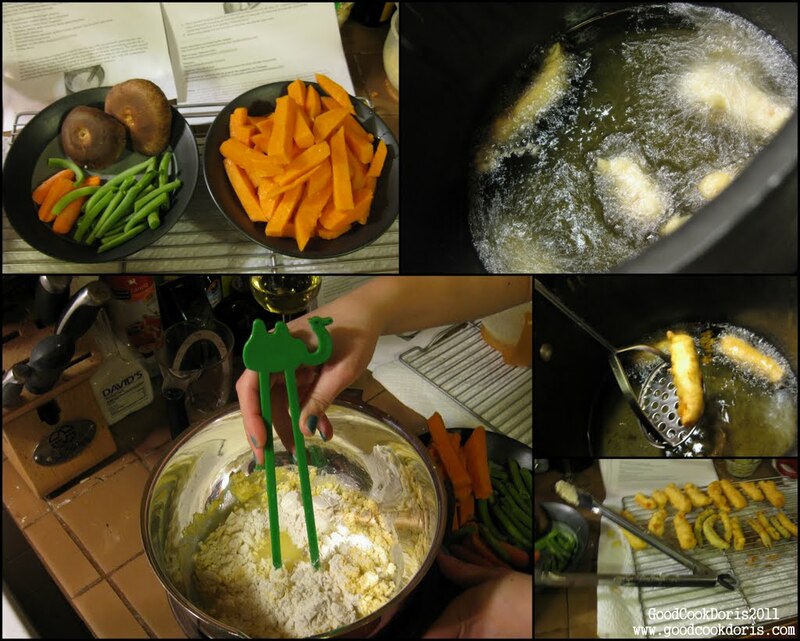 I have never dared to make tempura at home, but it's a staple of mine when we get sushi!! I have made calamari, so I'm guessing I could handle tempura. Yours looks delicious! And your sushi rolls do, too!! Wow - really impressed! This was definitely a project. I love that you used your potato masher to drain the tempura. I would have totally done the same thing! This is IMPRESSIVE! I love your tips for a cooking project. When I made baguettes this fall, I didn't read through the recipe and thought it took two days to make...actually it took three! Ever since then, I definitely read through recipes all the way through! 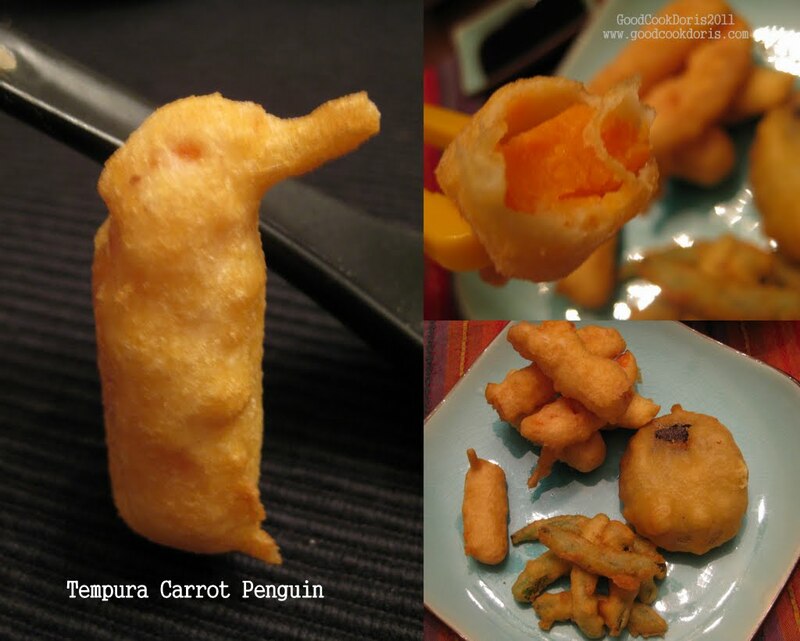 Your tempura looks so perfect! Nice job! Left over sushi make it to Monday lunch? This is such a great post! I love the step by step process description and photos (not to mention step one...), and I love that you put your spin on the challenge. And VERY cool that the hubby was so helpful! :) Everything looks delicious and it sounds like you had a great time! I love your penguin carrot! I am so glad you took a picture before eating it. Your organization realy works well for you - the whole meal looks amazing, and it sounds like you were able to get everything done without stressing! (The wine does help with that, too...!) Great work on this challenge! Thank you for sharing your creativity with us. Looks really awesome! Very ambitious adding sushi to the mix! Wow wow and more wow! Seriously impressive. I too have a sushi rolling set sitting in the cabinet that I need to use more often. I'm glad you had such a nice dinner! Superb! You did an amazing job!